Rotis and Parathas for a healthy heart. Good-for-the-heart ingredients like methi, soya, garlic, flaxseeds etc. are used together with healthy flours, in a very innovative way to make delicious, satiating and heart-friendly rotis and parathas. These rotis and parathas are not only cooked using minimum oil but are also designed carefully, giving priority to ingredients that are good for the heart. You can serve these with subzi and dal, or with just a bowl of low-fat curds and healthy chutneys, to make a nutritious and satisfying meal. 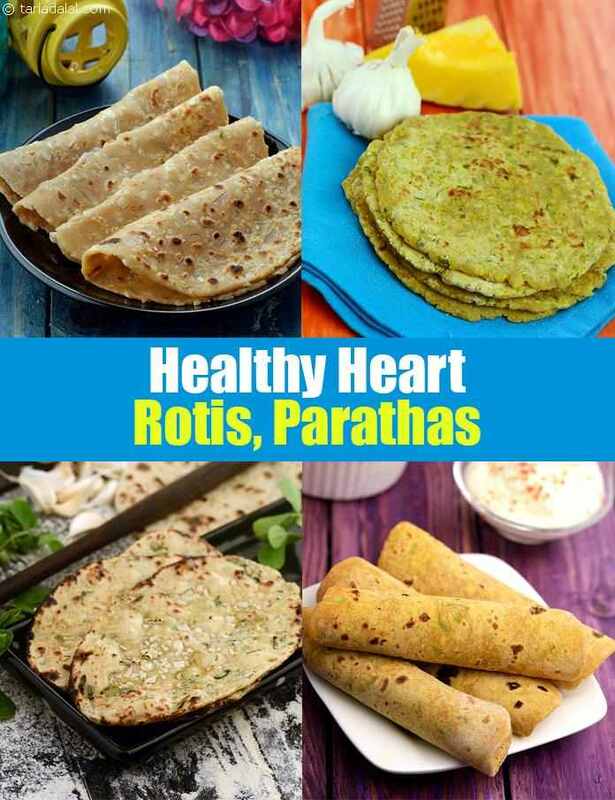 Healthy heart rotis. Try the classic recipe and learn to make Phulkas and include in your daily diet for a healthy heart. The curd added in the preparation of phulkas not only makes it soft but also adds some amount of proteins. This beta carotene loaded Lehsuni Bajra Aur Kaddu ki Roti is so filling and satiating that you won’t even need to have sabzi along with it. Just eat it as it is or with any healthy chutney or low-fat curds. Are you on a low sodium diet? Then this Cabbage and Onion Roti can perfectly fit in your diet menu as it is low in sodium, cholesterol free and loaded with heart friendly ingredients like garlic and cabbage. Start your day with this yummy Bajra Peas Roti and lower your cholesterol intake right from the start of the day. Healthy heart parathas. We always visualize fat laden parathas whenever we think about parathas. Ever thought you could make parathas using zero oil? Masala Paratha is one such recipe that is prepared using zero oil. Although it is fat free but is unbelievably delicious. Lazeez Parathas, as the name suggest are lazeez i.e. tasty and have a really good texture. Apart from this these parathas are a good source of protein and fibre both required for a healthy heart. Another wonderful recipe that we have is for Bajra Methi and Paneer Parathas, power packed with protein, vitamin C, fibre, calcium and magnesium. So much goodness for the heart!!! Do give a try to our other unique recipes like Oats and Cabbage Roti, Spring Onion Stuffed Oats Paratha and so on from our section below. Try our healthy heart rotis, healthy heart parathas and other healthy heart recipe articles below.